We are now in our eleventh month of the Cottage Cooking Club; a group of international blogger's cooking together and then posting our experiences along with the Hugh Fearnley-Whittingstall's cookbook, "River Cottage Veg". Our group is meant to be a project aimed at incorporating more vegetable dishes in our everyday cooking, and is and has been inspired by our dedicated leader Andrea of the The Kitchen Lioness. Every month Andrea picks one recipe from each of the ten chapters. We then pick and choose which one or ones we want to blog about in a single post. This month was special as we are half way through. And to celebrate this occasion Andrea sent us all a gift basket from Bonn, Germany. (See the adorable picture above). This was the first time I received a package from overseas, I felt so worldly. See what blogging can do. Thank you Andrea! Anyway we all choose a recipe from a list that was presented before but did not have the opportunity to prepare for whatever reason. I choose 3 recipes from this selection and was once again impressed by the simplicity and flavor of each dish. The first recipe I prepared was the Pinto Bean Chili. I prepared the autumn's version that consisted mainly of pinto beans, mushrooms and butternut squash. Cumin and allspice were added along with cayenne and fresh herbs. I served this with a dollop of sour cream and it was delicious. The next day we enjoyed leftovers atop a bed of whole wheat couscous. The second recipe was the winter stir-fry with Chinese five-spice which was my absolute favorite of all three. What is there about the smell of five-spice? The flavor is indistinguishable. Here the recipe instructs you to chop up all the veggies first and then to heat up the wok. The original recipe used egg noodles, but I substituted soba noodles which we absolutely loved. My husband said that this was "spoon worthy" which was a pretty big compliment. By the last recipe I realized that all of my picks had the same color of veggies, similar herbs and spices. Obviously I picked them all on the same night. Maybe I was craving something. Anyway for my third I prepared the carrot hummus. This particular recipe emphasizes that most any veggie or bean can make a delicious spread. I served this with everyday pita chips and it was so flavorful. Recipes adapted from the River Cottage Veg, by Hugh Fearnley-Whittingstall. First recipe; from the chapter "Comfort Food and Feast" Pinto bean chili (page 23). Second dish from the chapter "Pasta and Rice"Winter Stir-fry with Chinese five-spice (page 288). And last but not least; From the chapter "Meze and Tapas" Carrot hummus (page 296). Hi Theresa, yes it was so nice! What great goodies you got! The chili sounds delicious! Have a good day! Thanks Pam, love getting packages in the mail. Hi Cheri, a nice line-up for the month. I too was so thrilled with the lovely package from Andrea! I also love five-spice and thought the winter stir-fry with the noodles was sensational, it was also fun to use regular cabbage rather than the Asian varieties typically chosen. Your Pinto Bean Chili and carrot hummus look great too. It was a nice month to have a chance to go back on the past months, and I look forward to making up some additional recipes of interest in the interim as well. See you soon. Happy Spring! Thanks Peggy, this definitely was a fun month, nice to have a chance to catch-up. Have a wonderful week-end! Loving the sound of the pinto bean chilli. Think I'll have to try and borrow one of his books from the library. Something I haven't done in ages. And how wonderful to receive the package from overseas! Hi Johnny, Hugh's cookbook just keeps getting better and better, love the simplicity of his recipes. Love receiving packages in the mail. Carrot hummus sounds wonderful - and how nice to get a good package from far-far-away! Love all three recipes. Have a great week Cheri! Thanks Tricia, you too, enjoy your time with your family. Take care! Thanks Betty, it is a great book. Have a great week. I wish there were more time to cook. I haven't tried any of your choices yet, but they all look wonderful. The package from Andrea was so sweet, and exciting. She is such a lovely person. Hi Betsy, I agree we are so lucky to have Andrea as our fearless leader. Take care! Thanks Tandy, the gift was such a wonderful gesture. Take care. Thanks Kim, all in all it was a great Cottage Cooking month. I think the winter stir-fry was my favorite. I haven't had pinto beans since I left Tennessee. Carrot hummus is wonderful and the beans would be great too. Hi Maureen, I have not had pinto beans in a long time either, this recipe helped me remember how much I like like them. Thanks! Your selections all sound amazing! Love the chili, it looks perfect since it's still cold here and I adore the smell of five-spice powder too! Thanks Kelly, oh I agree, love the smell and flavor of 5-spice. It was a fun cooking month. I love all three dishes! We eat bean chilli quite often, but usually with kidney beans. Must use pinto beans next time. Hi Angie, I forgot how much I enjoy pinto beans, such a great recipe. Thanks for stopping by. I have always loved his recipes. Sounds like you found three more winners! Thanks Beth, Hugh's book keeps getting better and better. Take care! The winter stirfry is really appealing to me. At first i thought the bean chili was a cobbler or something similar but when i saw it was chili i got really excited. love me a good hearty bean chili! Thanks Kelsey, 5 spice has such a great flavor, never used it in a veggie stir-fry before. They are some of my favorite spices, too, Cheri! Isn't Andrea the best? Hi David, yes she is, she is amazing, so organized and put together, her presentation and pictures are the best. Thanks Charlie, usually I make all of our dishes from scratch so adding veggies is no big deal. but when I super busy like I have been it's much harder. 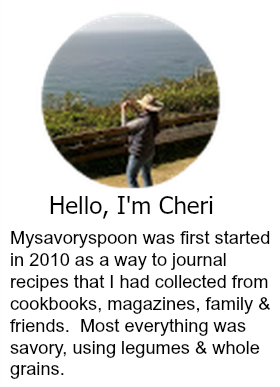 3 wonderful recipes, Cheri! I know what you mean about the smell of 5-spice. It's so unique and totally transforms a recipe! Thanks Helen, you always find the right words to describe something, yes 5 spice is like that. Great choices this month Cheri. I've made these dishes also and quite enjoyed them. I think serving the leftover chili over couscous is a fabulous idea and I agree that there's something very special about 5 spice - it certainly transformed the stir-fry. Thanks Zosia, it was a fun month to be able to go back and prepare a recipe that we wanted to but did not have time for. So nice I got to meet you. Hi Robyn, I really enjoy the cooking club I'm in, it's a wonderful way to meet others online and you can't beat all the great food. Both you and Teresa did "Winter Stir-fry with Chinese five-spice" and it is definitely going on my must-make list. I have never done many stir-fries but they would be a perfect fit for my lifestyle because I can make smaller portions. Since this has your hubby's special rating, I'll do it next month and let you know. I am returning to Colorado where it's still Winter so it's a perfect fit. I remember everyone raving about the chili so that's a doable while it's still cold in the High Country. Carrot Hummus, hmmmmm. Don't know. Worth a try, I guess. Nice Post. Fun to see what everyone is making. Hi Mary, yes I agree it's a lot of fun to see what everyone else is preparing along with the similarities and differences. The stir fry was amazing. Enjoy Colorado! That looked like a very cute box of goods! Such great choices! I love 5spice, too! Hi Abbe, it was such a treat to receive the goodies by mail, so thoughtful of Andrea. Happy holiday week-end to you! Thanks Ritu, thanks for stopping by. What a lovely gift from Germany! I think the stir-fry would be my favorite also but all three dishes look delicious. Thanks Susan, that was my first package from Germany, very special. Have a nice week-end! Lovely gift Cheri...and they all sound and look delicious...I am glad that you shared it with us. Thanks Juliana, this was a fun month for the cooking club. Wow ! That's a lovely gift box ! Hmm ... I used five spice often to cook but have not tried with noodle. Thanks for sharing. .. all 3 of your dishes looked delicious ^-^! Have a great weekend! Hi Karen, this was my first time cooking with noodles as well, will be preparing this again. Thanks! What a lovely gift box! I love winter stir-fry! Looks totally delicious! Thanks Marcela, such a wonderful surprise! What a nice surprise! I'd love that, too. Always enjoy seeing what dishes you're cooking for the Cottage Cooking Club. Great stuff this time! Thanks. Hi John, yes it's always nice getting packages in the mail. 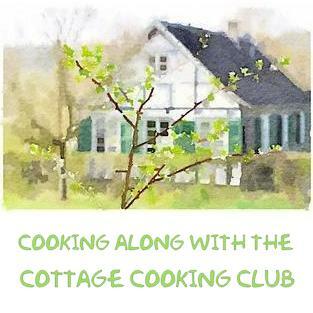 The cooking club is such a fun group, met so many nice people. It really was a wonderful surprise to get something in the mail from Andrea, wasn't it? She's awfully thoughtful. We loved the pinto bean chilli and I made the winter stir-fry for this month's post. Both will be made again and again. I haven't made the carrot hummus yet, but it looks wonderful. Hi Teresa, the stir-fry is one of my new favorite's from Hugh's book. And yes, I love receiving packages in the mail.......so thoughtful of Andrea! I love five spice but really don't use it enough in my cooking! Must search my cookbook for that recipe! Hi Joanne, 5-spice is such a unique spice to me but I love the flavor and smell. Great recipe! I'm grabbing the book and marking the page for winter stir fry! That sounds great. Can't wait to see more from this cooking club. Hi Lisa, the winter stir fry is one of my favorites, thanks for stopping by. It's great to see these recipes, Cheri. You know I only started to use five spice powder maybe a year ago for a particular recipe and I was really surprised by how much I like it. I tend to think pork with it but I will branch out. Hi Monica, me too, this was the first time that I used 5-spice with a dish that was not pork. It was delicious like this, will be making again. What a nice surprise package you got! And, this pinto bean chili looks delicious! Perfect comfort food! Thanks Julia, we really enjoyed the chili, the mushrooms added a meatyness (not sure this is a word) to the dish. All of these dishes look wonderful, but I think the stir fry with Chinese 5 spice is my favorite. Sounds and looks amazing. That was my favorite to Daniela, love the flavor and the taste. We love hot and spicy stuff! Perfect for the pinto bean recipe! Thanks for sharing all dishes!! Dear Cheri - hope you had a fabulous Easter weekend - I am quite happy that you liked your little Easter surprise that I sent in the mail - hopefully you got to dye some Easter eggs. All of the dishes that you chose look utterly delicious. I have made the stir-fry twice so far but omitted to take pictures, so I know that it tastes wonderful. The Pinto Bean Chili is quite the winner too and the Carrot Hummus has a great color and texture - wonderful with thos e chips indeed. Thank you for being part of our group - I am so very proud of all of you! Thank you Andrea, the stir fry was my favorite. What fun --- I've got my eye on that carrot hummus! Thanks Sue, it was delicious! that stir fry looks awesome! Thanks, it is my favorite out of Hugh's cookbook so far. Cheri I am in love with that stir fry!! Looks so sinfully delicious! Has it already been almost a year since you started River Cottage Veg?! How time flies. The carrot hummus is my vote - love the idea and the bright color! That stir fry looks amazing! And what a nice surprise package you got! Hope you have a great weekend Cheri! Wonderful dishes, so nice to be inspired. We love stir fry, so thanks for sharing. Gosh Cheri - we miss you - hope all is well. Hi Tricia, sent you an email, take care! All 3 dishes sound fabulous and how special of Andrea to send you all a gift. Happy cooking to you too Ami, thanks!